The transition to adulthood has become an increasingly telescoped process for Americans with marital formation occurring increasingly later in the life course. It is therefore striking to find a context like the U.S. military where marriage rates bear an anachronistic resemblance to those of the 1950s era. 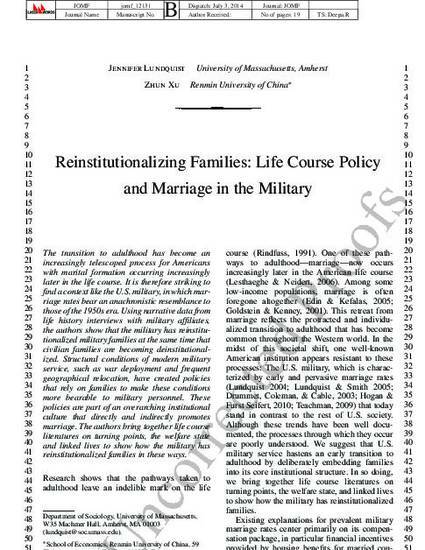 Using narrative data from life history interviews with military affiliates collected as part of a larger study on the impact of institutions on families, we show that the military has reinstitutionalized military families at the same time that civilian families are becoming deinstitutionalized. Structural conditions of modern military service, such as war deployment and frequent geographical relocation, have created policies that rely upon families to make these conditions more bearable to military personnel. These policies are part of an overarching institutional culture that directly and indirectly promotes marriage.